A most traditional Wantan Mee sold by the equally classic uncle, the lacklustre Jawa Mee, and the passable Or Chien. And after getting lost a little (yeah, as efficient as ever …. note to self : Probably should get myself a GPS unit to usher in the Year of the Tiger. Woo-Hoo? 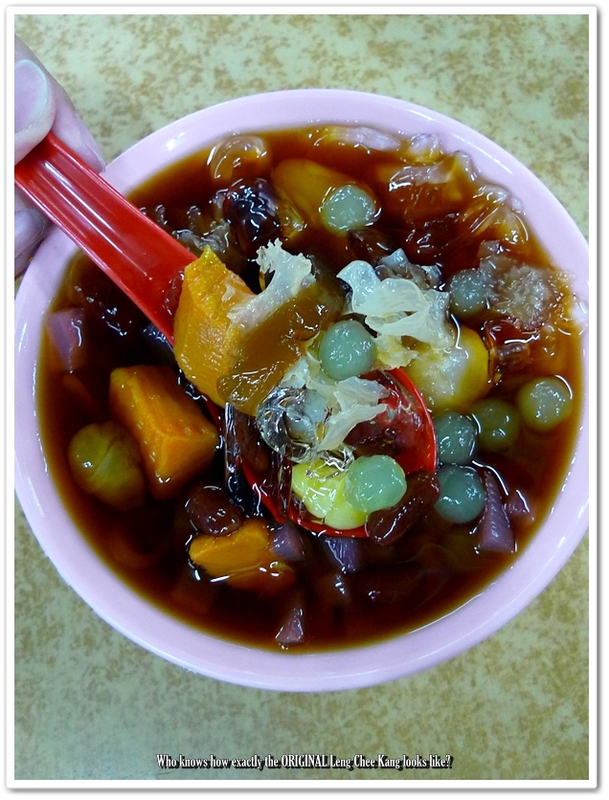 ), we finally managed to reach the hands-down most famous hawker outlets in Butterworth of Penang. Opens only for dinner until late night, the stretch of hawker stalls under those zinc roofs and fluorescent lighting did remind me of Ipoh’s very own Tong Sui Kai. The Wantan Mee was a surprisingly good find, but of course, judging from the amount of traffic (read : patronage) that particular evening, my doubt was cast off. Aside from forgetting my order (The stall was manned by an elderly couple after all, possibly in their late 60’s? ), the 20 minutes or so wait for the thicker strands of egg noodles as compared to the average, basking in the glistening mix of soy sauce, a dash of sesame oil, and garnished with lots of chopped spring onion was a case of patience well-paid off. The dainty pork wantan (dumplings in soup) fared not as stellar, but the thinly-sliced pieces of Char Siew were prove of their worth, exuding a most traditional flavour – with dark, caramelized edges (unlike the more common reddish/artificial ones at other Penang’s wantan mee stalls that I frequented in the past). Other notable items include the fried chicken stall – With options of either the pungent but very Malaysian-ized ‘sambal belacan’ flavour, or fried with Nam Yue (fermented bean paste). The Or Chien (oyster omelette) was a passable fare, with plump and juicy oysters, yet the eggs and sweet potato flour combination was not the most crispy one I’ve tasted and was instead starchy. The Jawa Mee was consumed by my friend, though the plate of yellow noodles blanched and subsequently drenched in the thick, starchy (again?) and sweet-spicy-sour gravy looked almost too bland to be relished. Pardon the dagger stare – She was a really friendly lady. The sheer number of stalls lining the street (Lebuh Kurau 5) was mind-boggling, and you either try most of them (come in a larger group for better coverage) at one go, hopping from stall to stall, or you can come back again and again (if you’re a Penangite, it’s darn easy. But not when you’re from the other states, or worse, countries!) 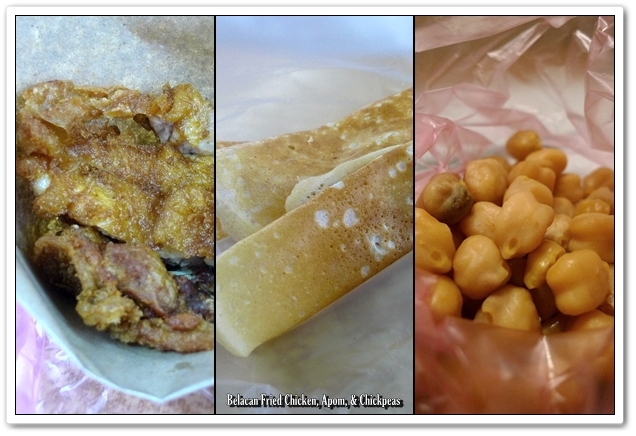 for the cheap, yet utterly delicious Penang hawker fares. The curry puff which comes with chicken or sardine fillings, was almost too good to be neglected. Authentic Indian style of fritters, in non-uniformed shapes and sized, the spicy fillings of chicken curry or the one with sardine were both top-notch. The pastry remained crispy even after a few hours of left-standing under the blaring air-cond. At RM1/USD0.30 per piece, the puffs came in rather generous mouthfuls. I wished I was there with a most-vacuumed stomach. And dragging a most hungry entourage of gluttons. 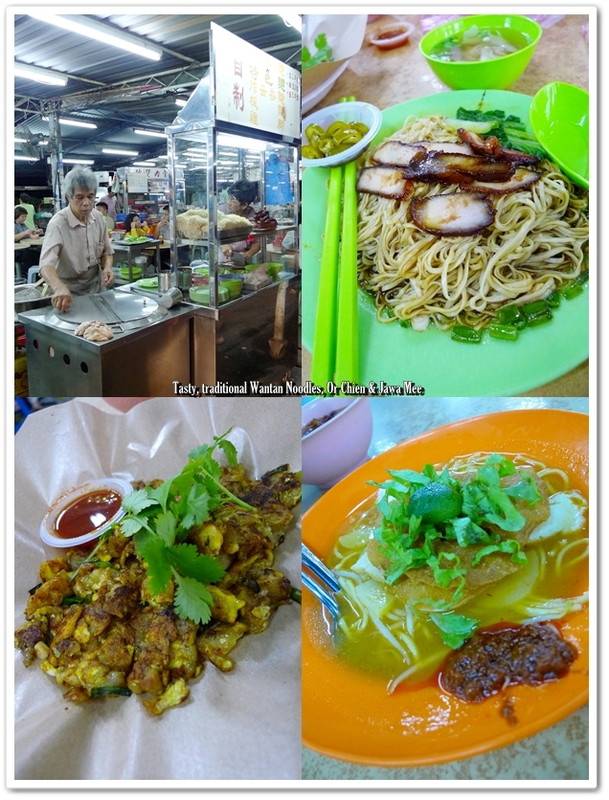 Well, there’s always another food session in Penang (quick, quick…. any takers/guides?!). Yet to sample CK’s recommended Lok-Lok (instant steamboat of skewered items served with chili/sweet sauce), which was crowded at the other end of the stretch of stalls. Stalls open from about 5pm onwards, until late night. And here’s a GOOGLE MAP for easy reference. Indeed they were yummy. I like curry puffs, esp those spicy ones. Sorry can’t join you in this outing but happy to know that you had a great time. 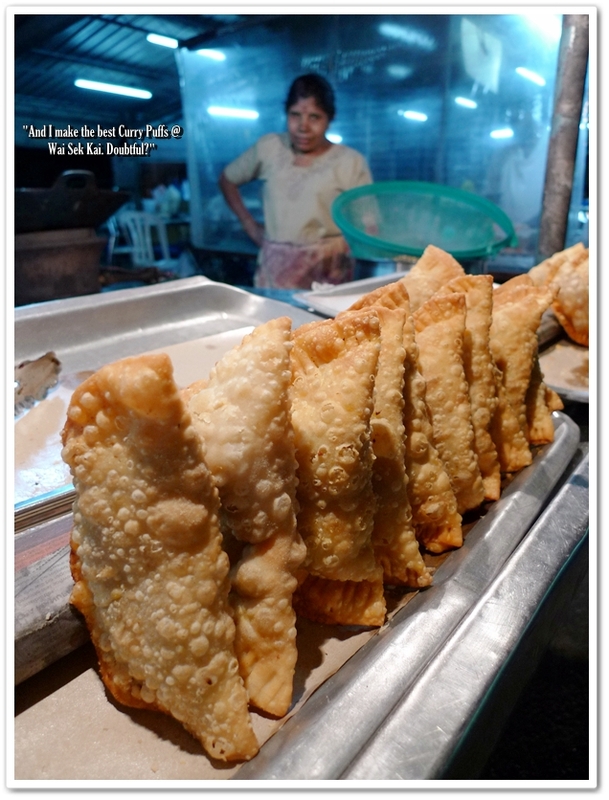 Looks like you manage to find out some other pretty good eats too (I have yet to try the curry puff). Okay okay … thanks to you, CK, for the recommendations. A whole group of bloggers? Hahaha, thanks, I’m honoured. Tai Ko? hahaha, far from it lah …. This place was recommended by the others as well. Did u not try the burger??? 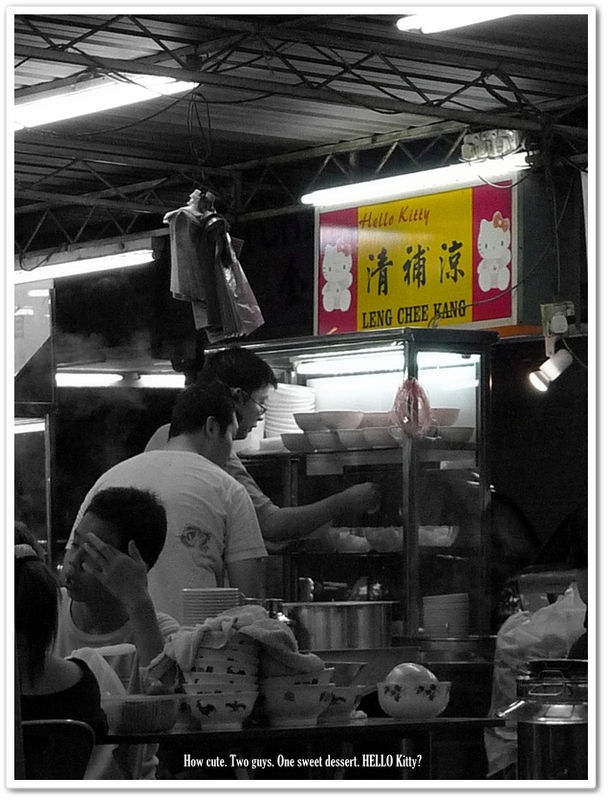 I remember the belacan chicken being a dream on the tongue, but never thought about trying the leng chee kang before. There are several stalls selling the same dessert, along the stretch of stalls. Oh, the OTHER end from the main road you mean? I noticed a fried noodles stall there. The lok-loks are superb! 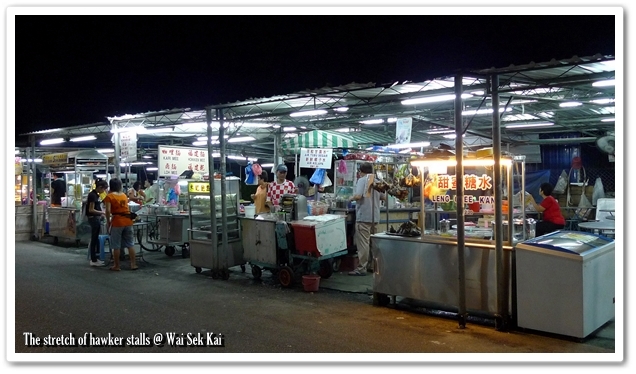 Especially the corner stall, the first stall as you enter Wai Sek Kai. The sauces to go with the lok-lok are good stuffs like the hae bee(dried prawns) tumis sauce! Try it. You’ll be hooked! Sure, Dora. Can see from the crowd forming that evening … the lok-lok must be REALLY good.